.Moderate to locally heavy rain will move into the area late tonight through late Tuesday night. A frozen ground and light snowpack will heighten the risk for flooding especially in areas with elevated river levels. A wintry mix may prelude rain, especially in northwest Ohio and northwest Pennsylvania. 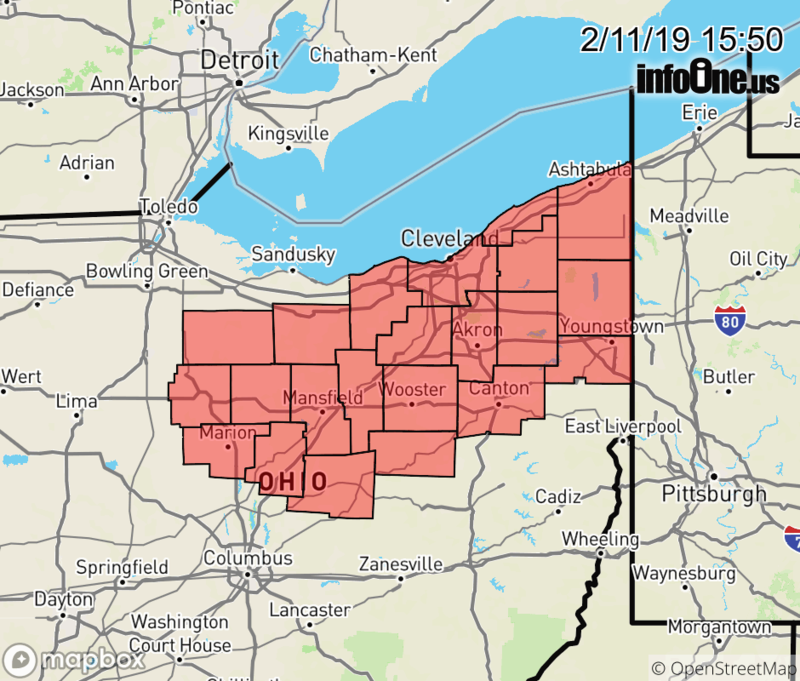 The National Weather Service in Cleveland has issued a * Flood Watch for portions of Ohio and northwest Pennsylvania, including the following areas, in Ohio, Ashland, Ashtabula Inland, Ashtabula Lakeshore, Crawford, Cuyahoga, Erie, Geauga, Hancock, Holmes, Huron, Knox, Lake, Lorain, Lucas, Mahoning, Marion, Medina, Morrow, Ottawa, Portage, Richland, Sandusky, Seneca, Stark, Summit, Trumbull, Wayne, Wood, and Wyandot. In northwest Pennsylvania, Crawford, Northern Erie, and Southern Erie. * From midnight EST tonight through late Tuesday night * Widespread rain will bring one to one and a half inches of rainfall to the region. Frozen grounds and elevated rivers and streams with a light snowpack will elevate the flood risk. * River flooding will be likely. Flooding of low lying areas and poor drainage areas are likely to flood. This may result in driving difficulties or even possible road closures. There is a continued threat for ice jam flooding in areas where ice remains.